"The vision of Kultklecks e.V. 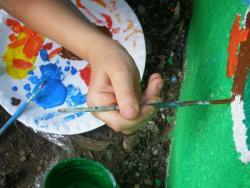 is to actively involve its members and other people in art projects. A personal success for all participants is ensured through professional guidance. In the long term, the personal achievements will encourage project participants to be active as artists themselves. By this means, Kultklecks e.V., its members and changing project participants directly drive forward the pursuit of art and culture. " Source: Preamble of the article of association of Kultklecks e.V. Kultklecks e.V. was founded in July 2008. The nonprofit organization aims to promote social art projects. It brings people together who want to be collective creative. Kultklecks is based in Munich, but operates worldwide: The members come from all over Germany and participate in arts projects at home and abroad. The nonprofit is actively looking for suitable forms of expression, which can inspire people for shared artistic action. One core activity is currently community murals in public spaces: Kultklecks cooperates with educational and social institutions to develop concepts for different target groups. The creative experience of the community is always in focus – in addition the nonprofit provides a professional project process, ranging from the planning and financing through the artistic guidance and project management to public relations. The aim is to make every project a success for everyone involved which fosters creativity and social interaction in a lasting way.